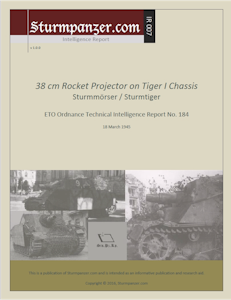 Intel Report on the Sturmmörser, with 6 photos. "A 38 cm (15 inches) rocket proejctor mounted on a modified Tiger I Chassis has been examined in the Ninth U.S. Army area. Although the nomenclature for this equipment is not know, it may be the vehicle referred to in German documents as the "Panzer Sturm Mörser Tiger"."